I've had some sweet compliments on my skin as of late and even though this month I had a bad break out and I blame my bad food binge and my body starting to feel run-down it came out on my face and I've been left a little scarred & now I'm full blown flu ridden, you can only imagine how I'm looking and feeling. So I'm kind of at the starting stage of my skincare again, dealing with pigmentation but I've more so just kept to the same routine but I have trialled some new products NBD! So far, so good but before I review that I need to review what's been used from July - November. My routine consists of rotating cleansers, I always keep the LUSH Ultrabland to hand because it gets off my eye make-up like a dream I constantly will say it's one of my favourites because it is, good for when my skin is dry / oily and it doesn't irritate when I have a break out. On my free face days I was using the balance Me. Pure Skin Face Wash - ahhhhhhhhh this face wash has been a God send for my skin. As my skin is combination normal-oily and prone to breakouts this has been one of the hero products that has helped to cease the breakouts. This cleanser doesn't make my skin dry once I have washed it off. No petroleum or sulphates within these ingredients but what makes the skin a lot brighter in appearance is the addition of anti-oxidant rich moringa and rice bran oils. 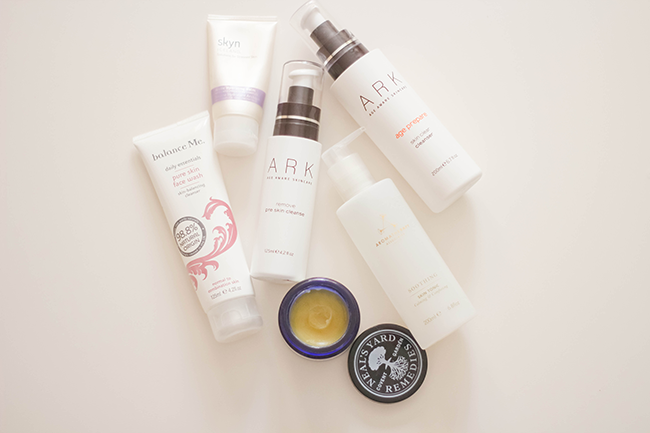 I then did move on from that to use ARK Age Aware Skincare, skincare that's tailored to your age and skin type and it's what I've used for the past two months. The two products I was kindly sent to review was the Remove Pre Skin Cleanse & Age Prepare Skin Clear Cleanser. Remove Pre Skin Cleanse is designed to rid your face & neck of all traces of dirt, make-up and excess sebum, I apply this water based cleanser onto dry skin and work upwards from the neck and really work it onto the skin and over my eyes as this even removes waterproof mascara, I've yet to open my eyes using this lol besides my other make-up removing cleanser so I try to have my flannel in the sink already been soaked and turn the tap on to wet my hands to turn this cleanser into a liquid emulsion, rinse my face and take the flannel to remove the rest of the residue. Straight after while the skin is still wet, I use the Skin Clear Cleanser this has a gel consistency which helps to balance out dry and oily areas of the skin, now that is perfect for me as my combination skin flops from one to the next. I have quite liked this combination I was a bit apprehensive, oh gosh a two step cleansing programme. Neal's Yard Wild Rose Beauty Balm this can be used as a rich cleanser, gentle exfoliant or deeply nourishing balm, I've used this mostly with all three of those steps when my skin has felt lacking in moisture and dull. There are a few downsides for me first is I really don't like the smell, it's the off putting part for me unfortunately and the fact that you have to remove make-up before using this. It gets high points for being very moisturising. The texture is smooth with small gritty gentle exfoliating particles. It could be good for those who really suffer from dry and oily skin. With the weather getting colder and more bitter, it would be a good moisturiser. I do just prefer my cleansers to do everything instead of having to use two. I haven't used toner as much as I use to. It began to serve it's purpose more as a catalyst than as something that was to balance the skin out after cleansing, it was more of a way to see if my skin was clean after cleansing, what traces were left over my skin but there is one that I did repurchase after being sent - which is the Aromatherapy Associates Soothing Skin Tonic it's expensive but besides the LUSH Tea Tree Water Toner. I'm not left dried out, that's what I HATE about toners, my skin feels stripped but I've found after cleansing this doesn't leave me dried out - of course sitting and not moisturising your skin after doing anything with water / toner your face will feel dry as that's the point of the next step but I've had toners that have even after moisturising feel like they've stripped me of my natural skin oil. This AA tonic is great as it's aimed towards being an anti-inflammatory and helps to soothe & calm the skin - of course A+ for those with skin that's prone to flare ups. It's key ingredients are Roman camomile, Arnica & Liquorice. I absolutely adore the Balance Me face wash, it's just perfect to use when my skin is in need of a boost! Great post, love your photography as always!